What happened to all of your New Year’s resolutions? Just a few weeks ago, you earnestly promised that you’d eat healthier, drink less, and workout more. The first couple of days were a breeze. Alcohol was the last thing on your mind after midnight toasts extended well into the next morning. Then football ruined your meal plan. It’s hard to eat salads as you watch the playoffs. Somewhere along the way, your gym time tapered off, as well. It’s already time for a reset. Sometimes all it takes is a change of scenery to put you back on the right track. The Philippines are a big change of scenery. The nearly 8,000 volcanic islands are covered with mountains and tropical rainforests. The Central Visayas are easy to reach once you arrive in the Southeast Asian country. The region surrounds Cebu City, the oldest city and the first capital of the country. From there, you’re heading west to Negros, the fourth-largest island in the Philippines. It’s known for its rich soil, hot springs, and dive sites. It’s also home to one of the top-rated resorts in the country. 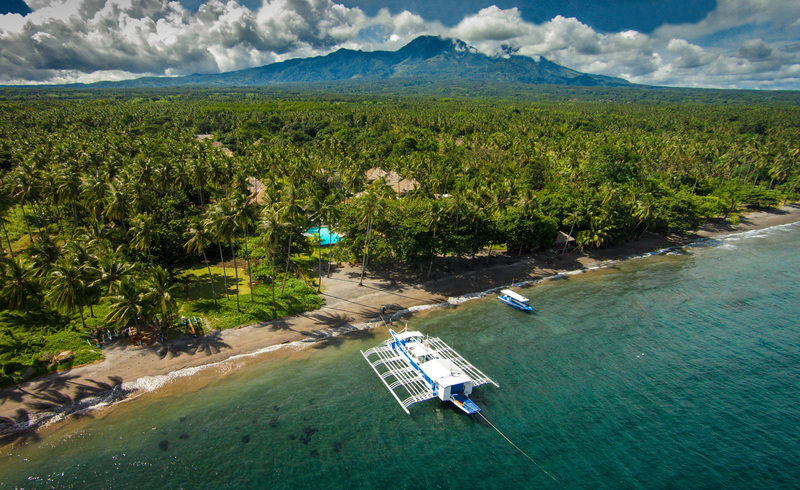 Atmosphere Resorts & Spa lies on the southeast coast of Negros overlooking the Bohol Sea. A coconut plantation used to sit on the seven beachfront acres. Ten years ago, it was replaced with a boutique resort. 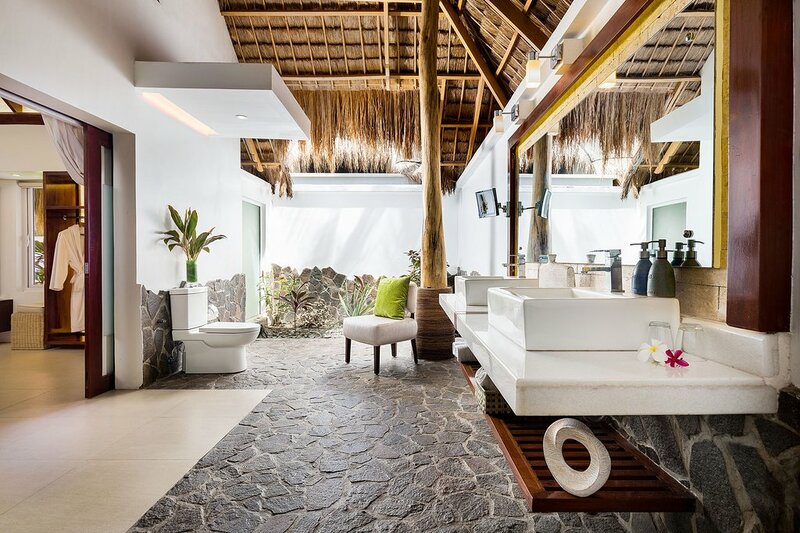 Freestanding suites, whose thatched roofs blend in with the thick foliage, feature relaxing patios (daybeds and hammocks), private gardens (outdoor bathrooms), and eco-friendly systems (solar-heated water). California king beds are added to the premium suites. Plus stainless-steel water bottles are among the amenities awaiting you. Since your stress level immediately decreases upon your arrival, the rest of your goals happen naturally. There’s a treehouse yoga studio—yes, the elevated platform really sits among tree branches—overlooking the white-sand beach. A gently paced beginner session is the perfect way to start the morning. You’ll find locally brewed coffee at the Coffee Shop and lots of fruit on the big breakfast buffet after you finish stretching. When breakfast is over, you’ll head to the dive center. It offers excursions to Apo Island (a marine sanctuary), lessons in muck diving (shallow, nutrient-rich waters with little visibility), and guided night dives (complete with hot chocolate afterward). Mountain biking, along the island’s central mountain range, and hiking, through the jungle to the Baslay Hot Springs, are options, too. While the garden spa—filled with a pond and streams, flowers and trees—will be awaiting your return after each day’s adventure. A traditional Hilot massage, in which banana leaves and dagdagay sticks help stimulate your nerves and improve circulation, is the first treatment you have scheduled. With adrenaline pumping through your body, it’s easy to focus on healthy dishes during meals. Blue Restaurant has a glass-walled kitchen, beachside tables, and lots of fresh seafood. Citrus-marinated kinilaw tuna in coconut milk and a quinoa salad with crispy tuna and wasabi are among the appetizers. Pan-seared tangigue (a meaty white fish from the Sulu Sea), served with sun-baked tomatoes, is one of the restaurant’s signature main courses. Then a simple dessert—fresh fruit salad in a coconut shell—will end dinner on a naturally sweet note. The only thing you don’t order is a cocktail. The drink menu sits on the edge of the table throughout the whole meal. But you’re never even tempted. You’ll save that for another celebration.